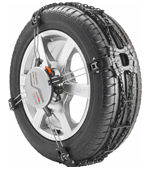 Weissenfels Clack & Go Quattro Snow Chains - The easiest way forward! 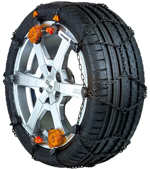 Weissenfels Tecna Snow Chains – A quality snow chain, light and tough! 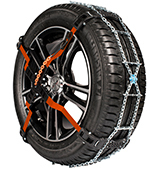 Everest Power snow chains from Snowchains Europroducts are a range of quality snow chains that are ideal for occasional use; for example, skiing holidays and general UK use. Produced from quality steel components and using a very simple inner cable mounting system. Weissenfels Tecna is the ideal budget priced snow chain to keep in the car boot ready for use, whenever needed. 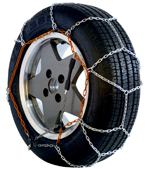 Just quickly slip on a pair of Tecna chains over the driving wheels and you are ready to go in no time at all. Like all Weissenfels models, fitting and using is really a simple operation and only takes a matter of seconds per side. The Clack and Go is a great value snow chain that utilises the Weissenfels unique auto tensioning and self centring system; so you don't have to stop to check and re tension the chains! All the parts are colour coded to make fitting as simple as possible. The Clack and Go Pro-Tech is the perfect answer for trouble free driving on snow & ice. The Pro-Tech uses the unique Weissenfels Clack and Go auto tensioning and self centring system; so you don't have to stop to check and re tension the chains. Fitting is quick and simple. The chains have a special black coating and have composite protectors for all areas that might come in contact with the wheels. 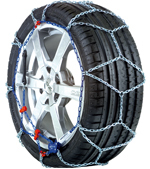 The ultimate front fitting Snow chain from Weissenfels. Easy and ultra quick fitting from the front of the tyre, with no reaching behind necessary. Fits cars that cannot normally use traditional snowchains due to brake, steering or suspension clearances being too small. Incredible grip on snow and ice. The Clack and Go Quattro is also ideal for cars with extra wide wheels and those with restricted access around the wheel arches. The Quattro incorporates Auto-tensioning so no stopping and tightening is required. The front mounting chain with a difference! By being able to fit the special mounting adapter in advance, the Weissenfels M91 Automatika can be fitted in seconds with absolutely no fuss! 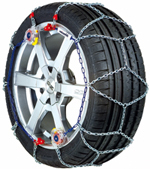 This is the ideal snow chain solution for quick trouble free easy fitting to wide low profile tyres and restricted clearances etc.